This 1" x 1/2" heart pendant is like no other. 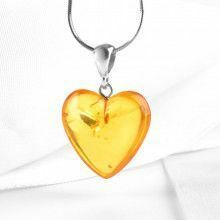 An upside-down amber stone teardrop sits in the center of a sterling silver heart that has holes punched out of it. Different and available for whichever chain you choose, as the simple bail has a roomy opening. Stone is about 1/4" x 5/16"